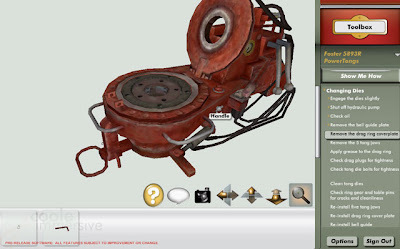 Since my prior posting Serious Games To Boost Safety On Oil Rigs, Coole Immersive has been broadening Industrial Games portfolio. Heavy industries like Oil & Gas, Mining and Construction share some unique characteristics and challenges. Driven by regulatory requirements and the need to optimize productivity in a competitive marketplace, employers are increasingly striving to implement competency-based training programs to address these challenges. Regulations demanding demonstrable measures to improve employee competence and workplace safety. 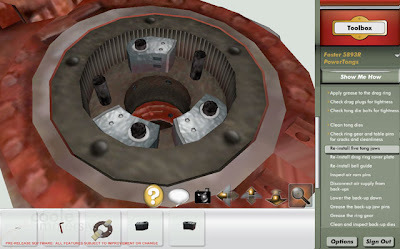 Using the same powerfully engrossing techniques that fuel entertainment games, Industrial Games provide learners with the ability to explore and review industrial settings in ways that minimize learning time and maximize retention and safety. Industrial Games are changing the landscape of what is possible in the world of learning, preparing, and understanding, ensuring all students have the ability to experience and perform job activities in a safe, controlled learning environment before tackling the real world by presenting information in an easy-to-understand, multi-modal format. Damage to costly equipment, injuries, and loss of life can be drastically reduced through the training provided by Industrial Games. 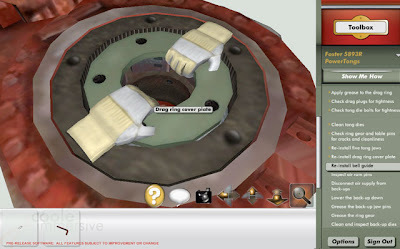 After completing one of Coole Immersive's industrial training simulations, students will have the necessary knowledge to transition from a realistic training environment to the workplace without the financial and physical risks attached to on-the-job learning. 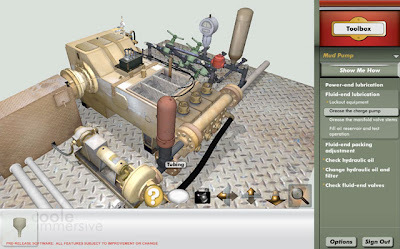 Coole Immersive's Industrial Games suite includes, among other products, SRT - Service Rig Training (object of my prior posting) and SRFM - Service Rig Field Maintenance. There are enormous costs associated with the unnecessary repair and replacement of Service Rig equipment due to a lack of regular, proper maintenance. Developed to complement Coole Immersive’s Service Rig Training program, Service Rig Field Maintenance can help you minimize these costs. After first providing a foundational understanding of the many systems found on a service rig, Coole Immersive’s Service Rig Field Maintenance then builds on that foundation with carefully designed, guided maintenance procedures. 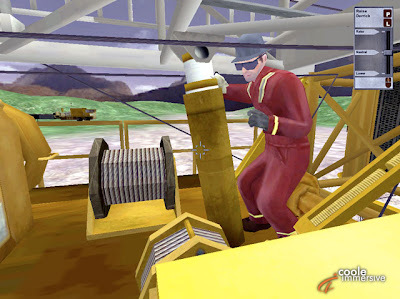 Developed with industry subject matter experts, and using cutting edge 3D modeling, animation and gaming technology, workers are systematically presented with the proper methodology for performing maintenance procedures on a service rig. With no risk to themselves, other crewmembers or the equipment, they perform the procedure by interacting with the accurately recreated apparatus. A virtual coach looks over their shoulder to correct their errors and offer advice. Real time content updates ensure every learner has access to the most complete, up to date information available, consistently providing your workers with exactly the procedures you expect them to perform, protecting both your equipment, and the environment. 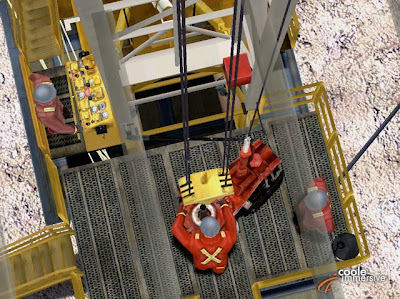 In addition to being an excellent primary training tool for new workers being exposed to service rig equipment for the first time, Coole Immersive’s Service Rig Field Maintenance is designed to be used as an ongoing, on-site reference manual, helping ensure a consistent, company - and subject matter expert - approved approach to maintenance. As such, ideal candidates range from new hires to experienced workers, as the training program standardizes the basic processes used for equipment maintenance. 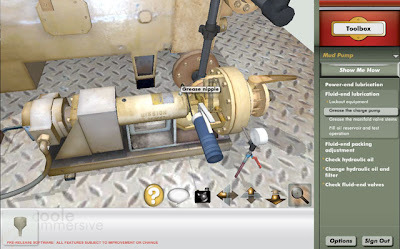 Learners don't just see maintenance being performed, they actually perform the process in a virtual environment. This gives the learner visual and tactile reinforcement of their new knowledge, resulting in a higher retention rate and a better, more efficient and competent worker. Well-trained and well-informed workers are more confident, take more initiative, and make fewer costly mistakes. 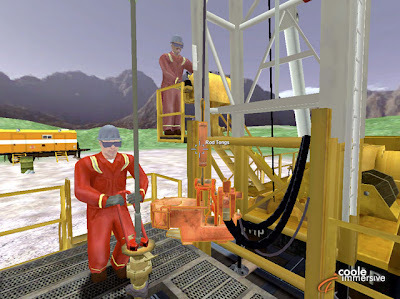 Coole Immersive’s Service Rig Field Maintenance provides an effective, consistent maintenance training solution, enabling workers to get the most out of their equipment. Where the real-world environment is dangerous. Where the real-world environment is unavailable, or costly to simulate in the real world. Coole Immersive Inc., formerly known as Terris-Hill Production, is a growth-oriented, privately held software development company based in Edmonton, AB, in Canada. Their mission is to revolutionize industrial learning through the use of innovative immersive learning systems. Coole Immersive develops Immersive Learning Systems to provide students with a “safe and effective place to learn”. Their applications consist of a combination of video, animation, assessment processes and simulation-based games run on a hybrid web and PC or Mac based system. The process complements traditional hands-on training of front-line workers. Cool Immersive targets learners under 35 years old, those who have grown up with the expectation of advanced technology, even in their leisure time. Internet, Cable TV, iPods and Global Positioning Systems were not around 25 years ago but now are commonplace.